Oh My...A Traditional Black Tea I Actually Like!!!!! Summary : This tea from Culinary Teas is considered a traditional black tea. And indeed it looks like it and smells like it to. But I found the taste of this tea to be much more delightful than other traditional english teas. Review : Well, it is the evening. Well, ok, it is the evening for me...as it is 1am! So, as it was the evening...and I was in the mood for something strong, but not exactly in the mood for something spicy (hence no chai teas), I spied a sampler tea package from Culinary Teas that said English Evening Tea. As anyone who reads my reviews should know by now, and not the worlds greatest fan of "traditional black tea." It's not bad...but I find nothing special about it, unless you add in some things to make it unique...such as an Earl Grey Tea (which I adore). Still, nothing ventured is nothing gained, so I gave this tea a try. Here is how Culinary Teas describes this tea on their website : "A very flavorful black tea that is light liquoring and bright (Ceylon and Darjeeling). English Evening is perfect for after dinner and promotes conversation." The aroma, what little there was, was not unexpected. Straight (or "traditional" if you will) black teas tend not to have overwhelming fragrances like many herbal and infused green teas do. So I was neither disappointed nor surprised by the lack of aroma eminating from the tea sampler bag I had. Once brewed, this tea really looks like any other black tea I've tried that has nothing added to it. The tea has a nice, pleasing coppery color to it. Yet, the flavor was a happy surprise. Most black teas I've tried tend to be bitter...and yes...I brew it up properly. In fact, most traditional black teas I've tried tend to taste the same, more or less. The flavor is full, the flavor is strong...it is just not entirely pleasant...let alone memorable. And admittedly, this tea from Culinary Teas shared a few of those qualities of other traditional black teas. I found the aftertaste to be basically similar to other black teas...which means I found it less than ideal. Some bitterness also creeped into the aftertaste to. Yet, while drinking this tea...I sort of found I enjoyed the flavor of it. I added nothing to this tea...no sugar, no honey, no flavorsticks and no milk. Instead...I drank it straight...something I know people from the UK will be absolutely horrified about. But yet, even straight...this tea has a nice, strong yet rather smooth flavor about it. Overall, this is a surprisingly good black tea. No doubt...if you like other traditional black teas...you'll like this one. But if you are like me, and have been less than impressed with other "traditional black teas," then I urge you to give this tea from Culinary Teas a try...as the pleasing flavor may surprise you. Recommendation : Yes. Any lover of traditional black teas will like this tea. And for people who are strange like me, who find the traditional black tea flavor rather boring, I suspect you might find a pleasant surprise in the nice, smooth flavor you'll find in the black tea. Tazo Earl Grey Scented Black Tea : An enjoyable black tea with a hint of spice...and you don't even need to add anything to it. Ahmad Teas English Black Tea : A black tea flavored with bergamot that has a odd, but quite unique, flavor to it. 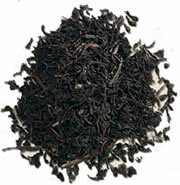 Culinary Teas English Breakfast Black Tea : Just your average traditional black tea with a full body flavor. Numi Indian Night Decaf Black Vanilla Tea : A rather harsh and nasty decaf black tea...but it's a decaf tea...so I should have expected this!